General. The village of Spontin is part of the community of Yvoir and is located in a valley of the Condroz plateau. 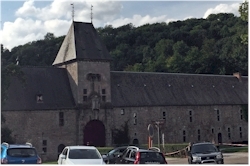 The village arose where there is a curve in the flow of the Bocq river, that debouches a few kilometers downstream into the river Meuse. Traditionally, agriculture and stone quarries were the most important industries in the area. A number of these quarries (most of them in the meantime abandoned) are silent witnesses of that. There are a few nice sights that give the village a certain popularity for day trips. History in short. On the spot where the village of Spontin is located, the ancient Roman roadway between Dinant and Huy used to cross the river. In order to defend the crossing, a keep was constructed. Over time, this keep grew into the present castle. 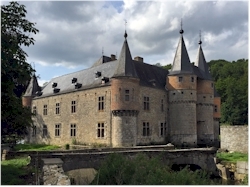 In the 12th century, the lordship of Spontin depended on the neighbouring stronghold of Poilvache. 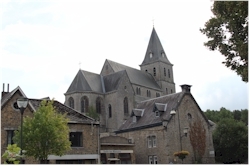 The village was located in the borderland between the rivalling Prince-bishopric of Liege and the county of Namur. Due to their rivalry, there were regularly violent armed clashes. Even when the county of Namur was incorporated into the duchy of Burgundy, the confrontations did not cease. There are quite a few castles, keeps and fortified homesteads in the area that are testimony to these turbulent times. During the Great War (1914), the village was almost completely destroyed; a monument for the fallen has been given a prominent place in the center of the village (next to the entry of the castle farm). The castle. Standing just at the edge of the village, the castle is the eyecatcher of Spontin. It's built at the right bank of the small Bocq river, while the village developed on the other side. The complex consists of the castle itself which is constructed on a rectangular layout and a fortified farm. The castle has slender towers and a drawbridge. The moat is fed by the Bocq river. Right in front of the castle stands the impressive 17th century fortified farmstead. The castle evolved from a 12t century keep that was built here to protect the ancient Roman road. Gradually, the site expanded but lost it's military importance around the 16th century. At that moment, the complex was transformed into a manor. The elegant tower spires and adaptations such as the characteristic red bricks date back to that time. Unfortunately, you cannot visit the castle but from the little park on the opposite bank of the river you have a very nice view on the chateau. A bit further downstream you can discover the water mill. 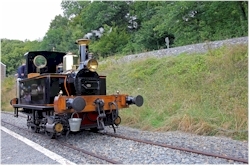 The Bocq historic railway. The old railway station of Spontin nowadays is the center of a historic railway. When the line was abandoned by the national railroads company in 1983, volunteers started a project to revalue the line and to exploit it again as a railway for historic trains. The railway runs between Cinay and Purnode and you can board in different stations, including the one in Spontin. Aboard historic trainwagons you are taken through tunnels and over brigdes in the green valley of the Bocq river. It's a very pleasant family activity and a must-do for amateurs of technique and trains. The sources of Spontin. The natural sources of Spontin were discovered at the end of the 19th century and commercialized shortly after that. For longtime they were very popular and the mineral water was even attributed healing qualities. Next to mineral and sparkling water, also sweet sirops were sold. The site of the sources is not accessible anymore since the exploitation went bankrupt in 2010. The geographical center of Wallonia. 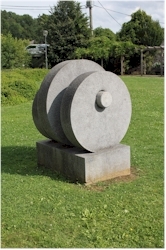 A small monument in the park of Spontin, representing millstones, indicates that the geographical center of Wallonia is situated in the village. It's actually not in the center but slightly outside of it (follow the roadsign). How to get to Spontin? This is best done with your own transport. The E411 highway is closeby. 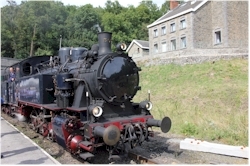 - www.cfbocq.be: website of the historic railway "Chemin de fer du Bocq"